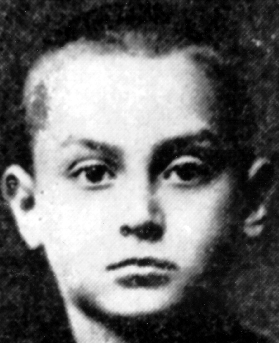 Sometime in early October 1943, fifteen-year-old Yitskhok Rudashevski and his entire family were rousted out of their hiding place in the Vilna Ghetto, taken to nearby Ponary, shot to death and buried in a mass grave. The Rudashevski family were among the last remnants of a once-vibrant Jewish community in the city once known as “the Jerusalem of the north” for its culture and scholarship. People came there from as far away as the United States to study in its highly regarded yeshivas. After the start of World War II, Vilna was annexed by the Soviet Union. It became a sanctuary to Jews fleeing from the Nazis, who occupied western Poland. All of that changed on June 22, 1941, when Operation Barbarossa began. On the day Germany invaded the USSR, there were approximately 80,000 Jews living in Vilna, many of them refugees from the Nazi terror. By the time the Red Army arrived and kicked the Nazis out three years later, Vilna’s Jewish population had been reduced –through starvation, disease, deportation and executions — to zero. Yitskhok (also spelled Yitzhak, Yitzak, etc., or anglicized to Isaac), was thirteen years old at the time his city was occupied by the Germans. An only child, he was the son of a typesetter and a seamstress. Talented in writing, history and languages, he was also a faithful Communist and a member of the Pioneers, the Communist youth organization. He not only wrote about his own life and his family and friends, but about the wider community events and the devastation the Germans wrought on his people. The historian Allan Gerald Levine called him “an astute and passionate observer of the times,” and compared him to Anne Frank. Nor was the diary Yitskhok’s only writing project. I got a taste of the historian’s task. I sit at the table and ask questions and record the greatest sufferings with cold objectivity. I write, I probe into details, and I do not realize at all that I am probing into wounds … And this horror, this tragedy is formulated by me … coldly and dryly. I become absorbed in thought, and the words stare out of the paper crimson with blood. The Vilna Ghetto, whose population initially numbered 40,000, had a rich cultural life, just like prewar Jewish Vilna had. There were theaters, cabarets, the symphony, art exhibits, a library, public lectures, and underground schools for both children and adults. Reality intruded, however, and in the final analysis the Vilna Jews were doomed to extinction. On September 23, 1943, the Nazis began the final liquidation of the Vilna Ghetto, which had by then been reduced to about 10,000 people. After a selection, those who could work were sent off to labor camps in Estonia and Latvia, where almost all of them died due to the brutal conditions there. Children, the elderly, and the sick were shot at Ponary or sent to the extermination camp Sobibor and gassed. Yitskhok, his parents and his uncle’s family chose to go into hiding rather than take their chances at the selection. In hiding he sank into apathy and said very little. After about two weeks in the hideout, they were discovered and taken to their deaths. The only surviving member of Yitskhok’s family was his teenage cousin, Sarah “Sore” Voloshin. Somewhere on the route to Ponary she was able to escape. She joined a partisan group in the forest and survived until the Red Army liberated the area in the summer of 1944. After the war was over, she returned to the family’s hiding place and found Yitskhok’s diary. 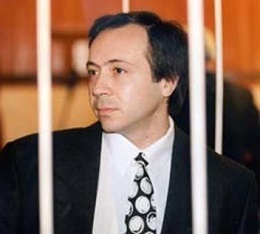 As of 2010, Sore Voloshin was still alive in Israel. 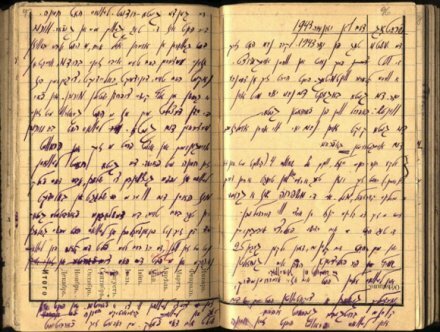 And the diary she retrieved had become one of the major sources on day-to-day life in the Vilna Ghetto. 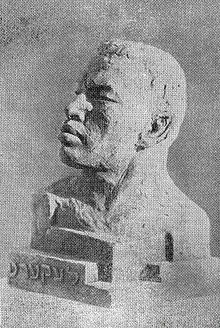 Yitskhok Rudashevski suffered and died in just the same way as hundreds of thousands of others, but unlike them he did not remain anonymous: he is one of the ghetto’s most famous inhabitants. His writings have been published in their original Yiddish and in Hebrew, German and English translations. Extracts of his diary can be found in several anthologies, and it’s available in its entirety under the title The Diary of the Vilna Ghetto. Sometime in the autumn of 1943, a refined actor had a family of Vilna/Vilnius Jews summarily hanged on a public gallows. Vilna* was one of the major Jewish ghettos in Nazi-occupied Eastern Europe. Noted for its rich cultural life, the Vilna Ghetto, which at its peak contained approximately 40,000 people, lasted from September 6, 1941 to September 24, 1943. By the end of its existence, however, through starvation, overwork, disease, and bullets, the ghetto’s population had been reduced by three-quarters. In late September 1943, the ghetto was liquidated. Most of the inhabitants were taken to the nearby forest in Ponar and shot, or sent to extermination camps in Poland or work camps in Estonia, where almost all of them died. Kittel was an actor. He graduated from the theater school in Berlin and from the plundering school in Frankfurt. On Sundays he played songs on his saxophone at the Vilna radio station. 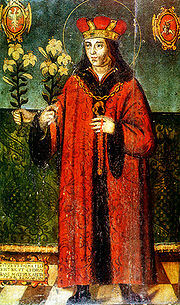 Kittel was not only the youngest of his colleagues; he was the most zealous … [His] reputation extended from Riga to Lodz to Warsaw. At first glance, you would never guess that Kittel was an executioner. Constantly smiling with his dazzling white teeth, he was perfumed, elegant, polite, and refined. After the ghetto was no more, a few skilled craftsmen and artisans whose work was essential to the war effort remained within the city at one of three labor camps. 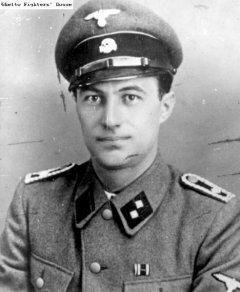 Karl Plagge, a German major in charge of the HKP 562 camp, was sympathetic to the plight of his workers and worked to save their lives, albeit without much success. For this, he would later be honored as a Righteous Gentile by Yad Vashem. During the liquidation, in an attempt to avoid capture, many of the Vilna Jews concealed themselves in hiding places and bunkers, called “malines” or “malinas”. Sadly, the Nazis caught almost all of them, but a few were able to wait out the carnage and then escape. The Zalkind family were among the fortunate people who were able to remain in hiding throughout the liquidation. But they did not survive for very long afterwards. Their final days are described in The Complete Black Book of Russian Jewry, a collection of accounts of atrocities in the Soviet Union from which the observation about Kittel above is also drawn. Journalists and historians began gathering eyewitness statements before the war was even over, and Ilya Ehrenburg and Vasily Grossman assembled and edited the accounts and finished the Black Book in 1946. It was the first major documentary work on the Holocaust. However, Stalin refused to allow its publication and had the type-plates and galley proofs destroyed in 1948. A few copies survived, and the book was finally published in Russian in 1993. The English translation came out in 2002. The full names of the Mr. and Mrs. Zalkind and their son are not recorded. Yad Vashem’s Central Database of Shoah Victims’ Names lists a Masha Zalkind, age 34, a store manager who was married to Moshe, and Hone Khona Zalkind, 2, whose parents were Masha and Moshe. Both lived in Vilna during the war and were killed in 1943; they might well be the mother and son from this story. There are several Moshe Zalkinds listed. One, a tailor who was born in 1907, lived in Vilna and was married to Masha. He’s the closest match, but it says he was in Estonia during the war and was killed in 1944. Kittel went over to the gallows to be sure that the rope was strong; then he began the execution process. The child was the first to be hanged. Then the mother. When the noose was tightened around the father’s neck, the rope broke. Kittel ordered a new noose to be made. But as soon as Zalkind was hanging from it, the rope broke again. Kittel was simply amused by it all. “If the rope should break a hundred times, I’ll hang you a hundred times,” he said. And he ordered the hangman to prepare another rope. Following the rule of collective responsibility, after Mr. Zalkind finally died, Kittel randomly selected fifty inmates of the camp, loaded them into a van and hauled them off to their deaths at Ponar. 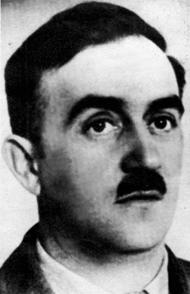 Only a few hundred of the Vilna Ghetto’s Jews, mostly those assisted by Major Plagge, survived the Nazi era. Some of the Germans who helped wipe out this city’s once-vibrant Jewish community were apprehended after the war and prosecuted. Bruno Kittel, however, disappeared without a trace and was never found at all. * At the time, Vilna was part of Poland. Vilna was its Yiddish name; the Polish name was Wilnow. The city is now the capital of Lithuania and called Vilnius.